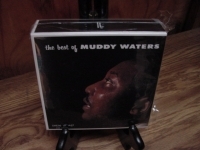 "Muddy Waters, The Best of Muddy Waters - 6CDs - CURRENTLY OUT OF STOCK"
MUDDY WATERS - THE BEST OF MUDDY WATERS OBI BOX SET WITH THESE TITLES -ELECTRIC MUD - REAL FOLK BLUES - MORE REAL FOLK BLUES - AT NEWPORT - BEST OF MUDDY WATERS AND WOODSTOCK ALBUM - - Japanese OBI MINI REPLICA LP TITLES making a 6 CD Box Set- Japanese OBI MINI REPLICA BOX SET Japanese re-mastered Mini LP replica Limited Edition Collection Recorded from the finest Original Masters available. Each title Comes with anti-static sleeves similar to Vinyl LPs, Cardboard packaging exact to the original LP, Re-sealable plastic wrap cases for protection of each collectible and include extensive Liner Notes Booklet. Actual miniaturized version of the 12" LP in 4" CD version Special VERY RARE LIMITED EDITION BOX SET ONLY PRODUCED ON FUTURES FOR THIS ONE TIME PRESSING -- were only available in Japan. MUDDY WATERS OBI BOX SET WITH THESE TITLES - ELECTRIC MUD - Track Listings 1. I Just Want to Make Love to You 2. (I'm Your) Hoochie Coochie Man 3. Let's Spend the Night Together 4. She's Alright 5. Mannish Boy 6. Herbert Harper's Free Press News 7. Tom Cat 8. Same Thing REAL FOLK BLUES - Track Listings 1. Mannish Boy 2. Screamin' and Cryin' 3. Just to Be With You 4. Walkin' Thru the Park 5. Walking Blues 6. Canary Bird 7. Same Thing 8. Gypsy Woman 9. Rollin' and Tumblin' 10. Forty Days and Forty Nights 11. Little Geneva 12. You Can't Lose What You Ain't Never Had MORE REAL FOLK BLUES - Track Listings 1. Sad Letter Blues 2. Gonna Need My Help 3. Whiskey Blues (Sittin' Here and Drinkin') 4. Down South Blues 5. Train Fare Blues 6. Kind Hearted Woman 7. Hello Little Girl 8. Early Morning Blues 9. Too Young to Know 10. She's Alright 11. Landlady 12. Honey Bee AT NEWPORT - Track Listings 1. I Got My Brand on You 2. (I'm Your) Hoochie Coochie Man 3. Baby Please Don't Go 4. Soon Forgotten 5. Tiger in Your Tank 6. I Feel So Good 7. I've Got My Mojo Working 8. I've Got My Mojo Working, Pt. 2 9. Goodbye Newport Blues BEST OF MUDDY WATERS - Track Listings 1. I Just Want To Make Love To You 2. Long Distance Call 3. Louisiana Blues 4. Honey Bee 5. Rollin' Stone 6. I'm Ready 7. Hoochie Coochie 8. She Moves Me 9. I Want You To Love Me 10. Standing Around Crying 11. Still A Fool 12. I Can't Be Satisfied 13. Rollin' Stone (Alternative Take) 14. Hoochie Coochie Man (Alternative Take) 15. Rollin & Tumblin Pt.1 16. Rollin & Tumblin Pt.2 17. Baby Please Don't Go 18. Mannish Boy 19. Look What You've Done 20. Got My Mojo Workin Pt.2 AND WOODSTOCK ALBUM - Track Listings 1. Why Are People Like That? 2. Going Down to Main Street 3. Born with Nothing 4. Caldonia 5. Funny Sounds 6. Love, Deep as the Ocean 7. Let the Good Times Roll 8. Kansas City 9. Fox Squirrel [*] These are Japanese digitally re-mastered Mini LP replica CDs (the OBI Edition). This Limited Edition Collection has only VERY FEW made world-wide and are immediately Out of Print. Recorded from the finest Original Masters available. Comes with anti-static sleeves similar to Vinyl LPs, Cardboard packaging like an LP, includes extensive Liner Notes Booklet. Actual miniaturized version of the 12inch LP in 4inch CD version.